We're always amazed by what you can do with a little imagination and a cardboard box. MAKEDO makes the process easier, and opens up possibilities to craft even more fantastical creations by providing clips, hinges and pins. 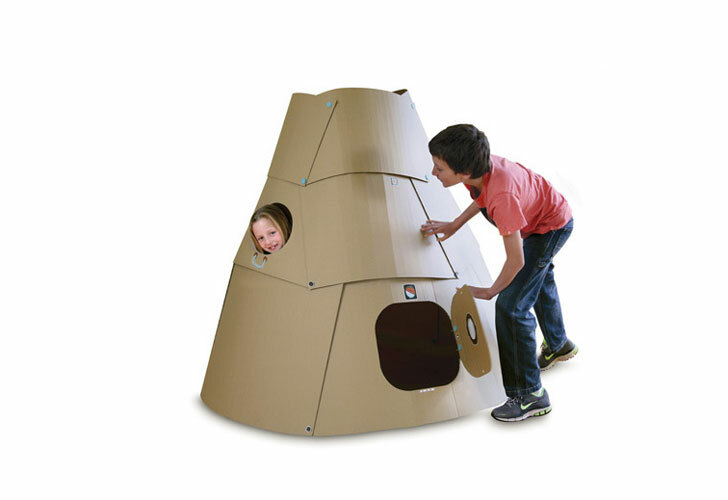 Their latest Find & Make kits go big, providing kids tools and inspiration to build awesome kid-sized play spaces - a Space Pod and a Shop. 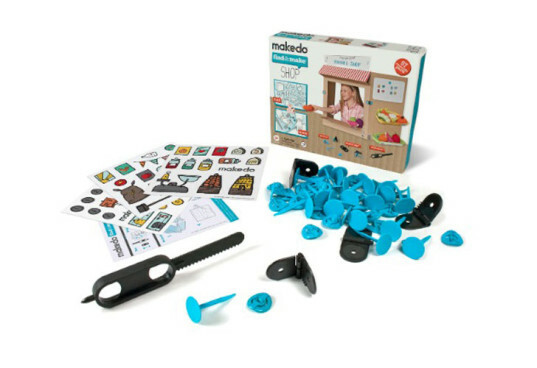 The MAKEDO Space Pod kit comes with 30 pins, 30 clips, 2 lock-hinges, 1 safe saw (for cutting cardboard), stickers and step-by-step instructions. To build your very own ship you’ll need to raid the recycling bin for large cardboard boxes or cardboard sheets and egg cartons or plastic containers. In about an hour kids can turn the MAKEDO parts and a pile of recyclables into a Space Pod that’s ready for its first mission. The MAKEDO Shop kit helps kids turn a large cardboard box, egg cartons or plastic containers and a few paper or card sheets into their very own corner store. The kit comes with 26 pins, 26 clips, 4 lock-hinges, 1 safe saw, stickers and step-by-step instructions. Your kids can create any type of store they like from the recycled materials. We love that MAKEDO kits teach kids about recycling and reusing. And we bet they’ll get a lot of play value out of these two new kits. The MAKEDO Space Pod kit comes with 30 pins, 30 clips, 2 lock-hinges, 1 safe saw (for cutting cardboard), stickers and step-by-step instructions. To build your very own ship you'll need to raid the recycling for large cardboard boxes or cardboard sheets and egg cartons or plastic containers. In about an hour kids can turn the MAKEDO parts and a pile of recyclables into a Space Pod that's ready for its first mission. The MAKEDO Shop kit helps kids turn a large cardboard box, egg cartons or plastic containers and a few paper or card sheets into their very own corner store. The kit comes with 26 pins, 26 clips, 4 lock-hinges, 1 safe saw, stickers and step-by-step instructions. Your kids can create any type of store they like from the recycled materials.